Comedy is the most difficult genre to crack, it requires brave filmmakers and actors who courageously stick their necks out for the sake of a laugh. And so when comedy doesn’t work, it falls hard, really hard. “Death of a Funeral”, a Brit-com that made some minor noise in film festivals last year and arrives straight to video this week, falls really hard. 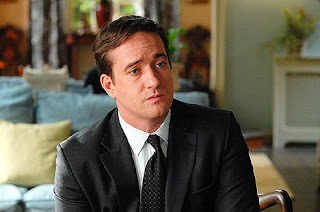 Daniel’s (Matthew Macfadyen) father has died and he’s been charged with coordinating the funeral arrangements. In fact, it’s the day of the funeral and when he’s shown the body and casket for the first time, the morgue has brought the wrong body. It will be a day filled with a series of these nightmarish events which will turn his day of mourning into a day of hair-pulling stress and anxiety. From the user-comments around the internet and some of the quotes on the DVD box, apparently many people found this film funny. In fact, Richard Scheikel describes it as “Insanely Funny”. Why, how and when comedy makes you laugh is an elusive question – and I can only respond with my gut reaction- but there are fundamentals in structure and timing that need to be followed. The filmmakers have the most of the timing down, but it sorely lacks freshness. “Death at a Funeral” failed for me, because the gags felt old – 20 or more years old. If the film were made in the 60’s, the black humour would have worked. But funeral comedies have already pushed the boundaries of good taste far beyond this film and so “Death at a Funeral” appears more light grey than black. The film relies on a series of well-worn comic situations. First there’s Simon who accidentally swallows an acid pill thinking its valium and spends the entire film ogling and overacting his acid trip; There’s the dwarf, Peter, who reveals a dark homosexual secret about Daniel’s father and blackmails the family for a piece of the inheritance; There’s Daniel’s Manhattanite brother whom Daniel resents for the success he’s never been able to achieve; There’s the n’er-do-well Howard who spends the first 15mins bickering with Daniel about being shafted on his parking spot. And at one point, Uncle Alfie, who is in a wheelchair, gets Howard to help him onto the toilet seat before his craps his pants. Without Peter Sellers, Rowan Atkinson or John Cleese, the actors playing the roles just don’t have the chops to sell us these overused gags. After 15mins I was checking my watch and I actually turned the film off at an hour, intending to commit a faux pas and write this review without seeing the ending. But after some research, I read that the backend of the film was apparently better than the front. So I watched the rest of the movie. I was misinformed. It was dull to the very end. On paper, “Death at a Funeral” has great potential. Its pitch likely included influences from the great tradition of British comedies - “A Fish Called Wanda”, “Local Hero” or “Faulty Towers”. Unfortunately it turns out to be a dreadful comedy paved with good intentions made 20 years too late. I was so excited about watching this movie because I kept reading on the internet reviews that it was the new "Four Wedding and a Funeral". It is so not. I was disappointed and bored. I thought it could be funnier but it sort of went nowhere.